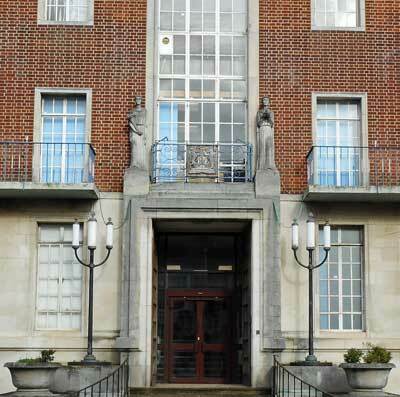 The 'new' County Hall in Newport High Street was built in the late 1930's on the site of the former Swan Hotel, in which the County Council were based for a number of year, and a number of neighbouring properties. 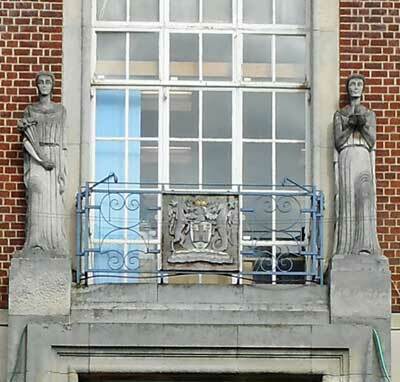 Above the main doorway (2018, now disused) stand two figures, representing, on the left, Public Service, and, on to the right, Knowledge with centrally, the County coat of arms. The two figures were carved by Mr. V. Gilles of Southampton to the designs of J.H.Harwood, of the Sheffield College of Arts.